The question of money supply and inflation has been erroneously set in stone philosophically predominantly by the debasement of Spain and Britain during the period of Henry VIII. This was really a period where there were various countries and their currency completely relied on the exchange market in Amsterdam, which was based entirely upon their metal content. This period was far less judgmental insofar as we have today where currencies rise and fall purely on anticipation of political events. 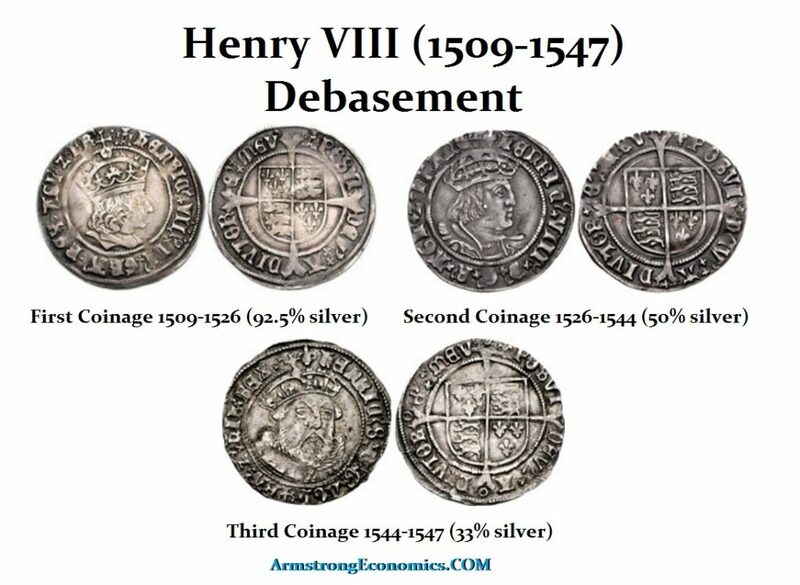 During the middle ages, this influence of anticipating future value based upon possible political decisions was not readily dominant and the coins of one nation were compared entirely on their metal content rather than political events. For example, because of the French at war with Britain, they created a wave of inflation that spread like a contagion to other nations, namely Spain and Italy, because money was commodity based using gold and silver. In this way, there was really a single currency base among nations and the problems of one would be exported to all others by their debasement. We can see that wages more than doubled even in Spain as inflation became a contagion. To cover the cost of war, France began debasing their gold and silver coinage. 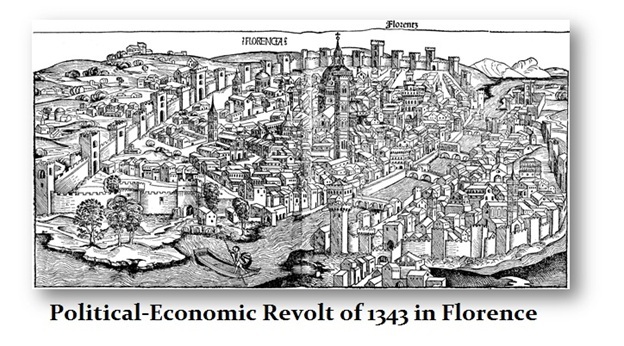 There was clearly economic pressure for in 1305, the French Crown issued a restored monetary system. The gros now appears at 12d fine and the denier are also returned to a sound MONEY standard. These were now worth 300% greater than the debased coinage in circulation. The gros was now worth 10.5 deniers for with the end of the war, precious metals fell in value for a marc of silver collapsed back to 56s 8dt. Despite the end of the war, gold demand remained strong in all countries. By 1311, the coinage once again was debased as precious metals rose in value. A new gold coin was issued known as the angel d’or that was valued at 20 st. The silver to gold ration now jumped to 15:1. Silver begins to disappear being hoarded and gold becomes more commonly struck in France and England. Yet the volatility seems to have been incredible for the times. Gold prices crashed in value and the agnel d’or dropped from 20st to 15st. Silver collapsed falling 25% in value at this time, yet the silver to gold ratio remained at 15:1. Silver began a three-year rally reaching a ratio of 12:1 in 1316. This rally coincided with the death of Philip IV, but his successor, Louis X (1314-1316), appears to have struck no silver gros whatsoever. The only coins struck in his name are the gold angel. 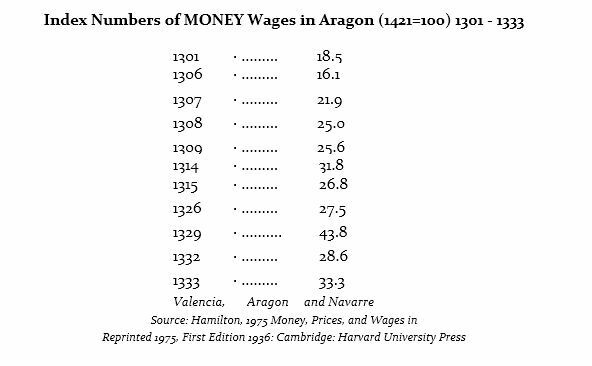 The coinage reflects a surge in inflation as reflected in wages going into 1329. We see bullion prices rising again starting in 1322 whereby in October that year, there appears to be a significant debasement whereby the fineness collapses to about 47%. The debasement continued in 1323 and again into 1326. The Capetian dynasty dies with the three sons of Philip IV, none of whom had produced a male heir and thereby the line passed to the Valois Dynasty. We come now to a Monetary Reform of 1330, with a major effort to restore sound MONEY once again. They did learn that one could not simply return the MONEY supply to a sound footing overnight. They tried to phase it in more gradually, for it has the tendency to lead to the new MONEY merely being hoarded. 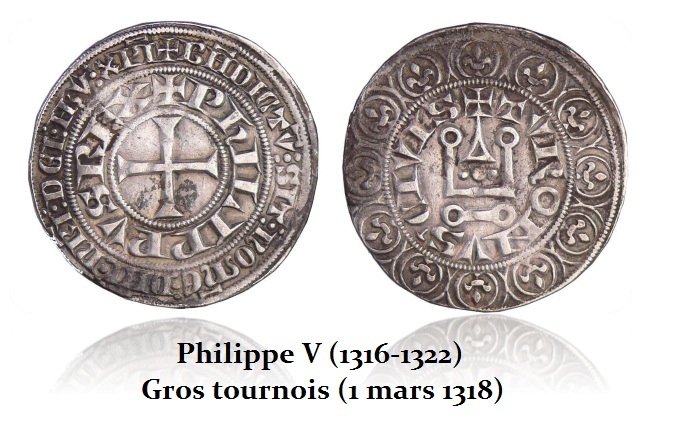 Nevertheless, this monetary reform under the new Valois Dynasty was short-lived, for, in 1337, there was the start of the Hundred Years War with England and the invasion of Edward III (1327-1377). Their accounting books of Peruzzi Company, one the main Florence bankers, covering the period of 1335 to 1343 have survived to provide us with the detailed footnotes to the history of this period. For by 1330, the Peruzzi Company was the second largest banking house in Europe, just behind the Bardi, with 15 branches covering the Middle East all the way up to London. They were not just a super-rich merchant-banking firm they were one of the earliest truly international companies to emerge. Their capitalization stood at 100,000 gold florin in 1330 and they had a staff of about 100 people. The Peruzzi had made a fortune on taking English wool and turning it into fine cloth in Bruges, and selling luxury products to Avignon, London, Paris, and Naples to mention a few. They also dealt in spices, silk, drugs, and other luxury items from the East. They emerged as a great wholesaler supplying credit to the lesser merchants and creating a vast sales network. They became dealers in large quantities of commodities that even included grain from Italy. Yet with the defaults of Edward III, the Peruzzi collapsed in 1343 and were driven into bankruptcy by 1345. Because of the French/English war, the French drove the price of silver up dramatically. In Florence, they utilized a two-tier monetary system with silver used as the domestic coinage for wages and gold for international transaction much as Bretton Woods after Roosevelt’s confiscation of gold in 1934 domestically. Because of the French debasement, the price of silver rose and this disrupted the economy in Florence. Companies could no longer pay wages in silver and businesses failed. As unemployment rose, the people, not understanding the real cause, stormed the palaces of the banks and burned them to the ground. The bankers were blamed for the action of kings. Therefore, the precious metal monetary system was by NO MEANS a good stable system where money was tangible. It also allowed for contagions that people did not understand. If we are going to create a new monetary system, the “reserve” currency cannot be one of any single nation. It must be a basket at best for this is the ONLY way to prevent contagions. Currently, with the dollar as the reserve currency, because we still use Demand Economics, then the raising or lowering of interest rates sets in motions contagions that will either export inflation or deflation to other countries. We need to understand how contagions take place and their origin.